Dentures are removable replacements for missing teeth and adjacent tissues. They are made of acrylic resin, sometimes in combination with various metals. Complete dentures replace all the teeth while a partial denture fills in the spaces created by missing teeth and prevents other teeth from changing position. If your denture no longer fits properly, if it breaks, cracks or chips, or if one of the teeth becomes loose, see your dentist immediately. In many cases, dentists can make necessary adjustments or repairs, often on the same day. Complicated repairs may require that the denture is sent to a special dental laboratory. Over time, dentures will need to be relined, rebased, or remade due to normal wear. To reline or rebase a denture, the dentist uses the existing denture teeth and refits the denture base or makes a new denture base. Dentures may need to be replaced if they become loose and the teeth show signs of significant wear. Denture adhesives can provide additional retention for well-fitting dentures. Denture adhesives are not the solution for old, ill-fitting dentures. A poorly fitting denture, which causes constant irritation over a long period, may contribute to the development of sores. These dentures may need a reline or need to be replaced. If your dentures begin to feel loose or cause pronounced discomfort, consult with your dentist immediately. 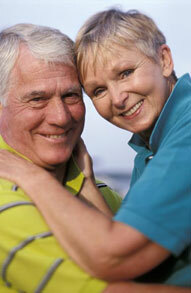 For more information on Dentures in the Mount Prospect, IL area, contact George Mui, DDS, Ltd. Gentle Dental Care by filling our Contact Form or calling (847) 253-5901 today!